Let’s take a quick look at these income streams. “Interchange income” is what card companies charge merchants for transactions. This is a legitimate fee that merchants don’t like but accept as the price of convenience. Interest income is the loan-shark level rates cards charge their customers who carry a balance. According to Bankrate.com, the average rate is currently 16.9%. Anyone who pays this kind of interest on a loan in today’s artificially-low-rate world is clearly disabled in some fundamental way and should not be preyed upon by lenders. But in the world of credit cards they’re celebrated as ideal customers. Late fees go hand-in-hand with exorbitant interest rates. 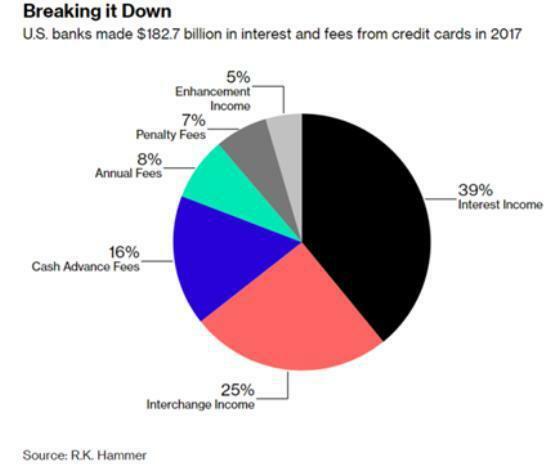 If a customer/victim is desperate enough to pay 17% interest they’re probably going to miss the occasional payment, allowing the card companies to tack an extra $30 or so dollars onto the ever-expanding balance. Your credit card issuer isn’t really doing you any favors by letting you take out a cash advance, which can be done via ATM or through convenience checks your card issuer sends in the mail. They’ll make money off the transaction, by charging a cash advance fee each time you take out a cash advance against your credit limit. That’s on top of interest charged starting from the day you make the cash advance. Most credit card issuers charge either a flat fee or a percentage of the cash advance amount, whichever is greater. For example, a typical cash advance fee is the greater of $10 or 5%. So, if you take out a cash advance of $100 under these terms, your cash advance fee would be $10 since 5% of $100 is only $5. On the other hand, if you take out a cash advance of $500, your cash advance fee would be $25. With some credit cards, you may face a cash advance fee even if you don’t take out a cash advance from the ATM. The readership of this blog skews older, wiser, and more affluent, so let’s have a show of hands: How many of you pay frequent late fees on your cards? Virtually none? Good for you. How many of you carry a balance and pay double-digit interest? Virtually none again? Excellent. How many of you pay an annual fee on your card? Some of you? Understandable because card issuers make fee-charging cards sound like status symbols, but in reality they do virtually nothing that a no-fee card can do. So cancel that high-fee card and replace it with one that lets you buy stuff and accepts full payment at the end of the month – which is to say any standard-issue Visa or Mastercard. Now, if you’re not feeding the credit monster, where are all these billions in interest and fee income coming from? Obviously from the poor bastards who can’t manage credit and because of that are specifically targeted by these loan sharks with stock tickers. Now that Goldman and Wells Fargo are jumping in, look for mail carriers with trailer parks on their routes to have sore backs in 2019. The only happy part of this story is the timing. This late in the cycle, an expansion into subprime consumer lending (which is what credit cards are as currently marketed) is virtually guaranteed to blow up in card issuers’ faces.